You're looking for something to impress people with? You want to do something that nobody else can do? You want to be a hoot at any party? Then this is the app for you! 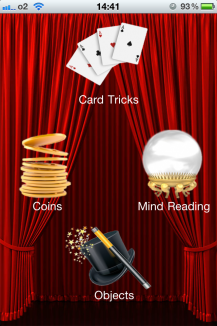 Use the Magic-Tricks Tutorial to learn awesome magic tricks in no time! Magic-Tricks Tutorial explains the basics of magic tricks in easy-to-follow step-by-step-instructions. 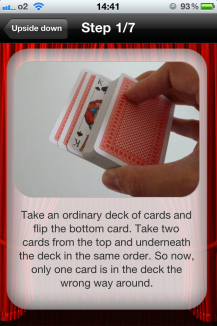 Additionally, the pictures help you to better understand the instructions and recreate the tricks. From the “Disappearing Coin” over the “Heart of Cards” to “Mind Reading”, the whole spectrum of magic tricks is presented here. We explain magic tricks which can easily be understood by the layman, but are still impossible to figure out for the audience. Do you have what it takes to be a great illusionist? 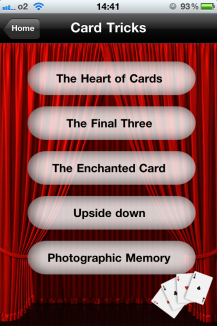 Find out by getting the Magic-Tricks Tutorial app.